Last episode, we saw Minily Edward Horse digging through a box to find a huge pair of scissors, what did Edward Scissorhands inspire Edward Horse to do? What is the connection between Edward Scissorhands and Edward Scissor-Horse? Hey Jolly Wolf, wait for me to come back! Jolly Wolf totally clueless and Edward Scissor-Horse continues to move on. 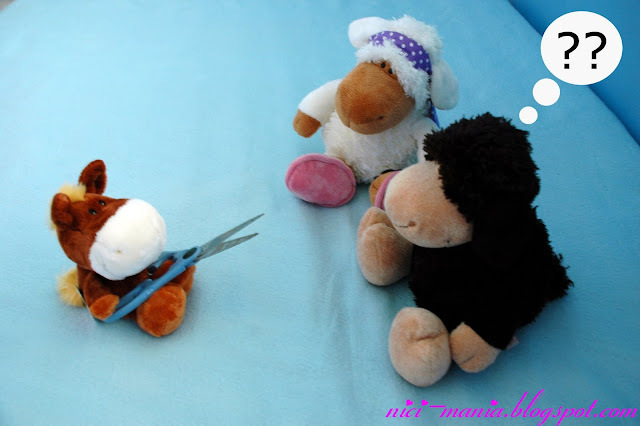 He then stumbles upon a trio of sheep and wolf plush having high tea, or 'high peanut butter'..
Jolly Sheebo to Hugo Wolf:"Did I just see a horse with scissors walk by?" Hugo Wolf :"I think so...why?" Jolly Sheebo :"I think he was staring at you for a moment just now"
Jolly Rosa :"I SEEEEE HIM!!" 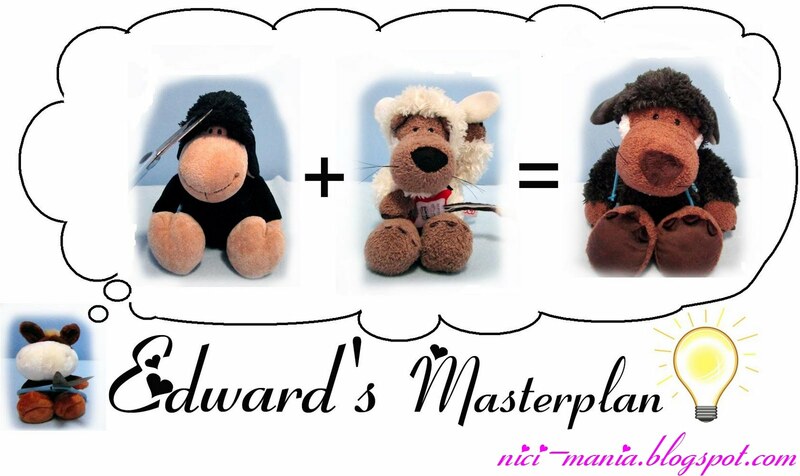 Finally..Edward Scissor-Horse found his target! Edward moves towards his plush target gingerly but the vigilant black sheep sensed the danger approaching, he turns around and spots the Edward Scissor-Horse with a huge pair of scissors in his bewilderment. Jolly Ben is dumbfounded by what Edward is trying to do to him.. Thus, Edward Scissor-Horse explains his "Master Plan"
Jolly Ben: What logic is this?!! You dumb horse!! Jolly Wolf: I don't mind a set of black sheep's clothing to change. Heheheh, poor Jolly Ben, keep out of this pair of scissors!!!! Hehehe :D Jolly Ben knows his soft black plush are too precious to be cut! PS: I'm sorry I couldn't find any brown minily =( Guess they're all sold out. We are so lucky you have unravelled the masterplan, because otherwise we would not be able to see Ben any more, acting in more of your wonderful stories. Goes to show; keep household appliances away from children.. AND sheep!